Another fast week has gone by! Seems like August blew through like a fast wind! 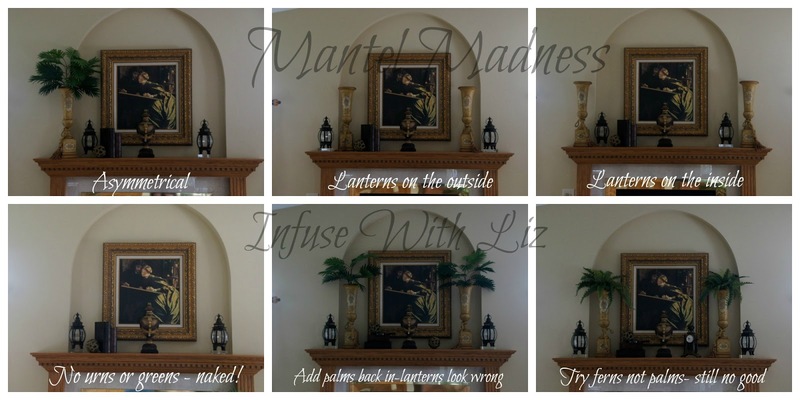 I started this week with a post about a little decorating I did on the fireplace mantel which I called Mantel Madness! Please check it out "here". I had some fun putting together a Tablescape this week you can see "here". I want to thank everyone for so many nice comments- it boosts my morale a lot. I was surprised how many people have either lived in or visited Michigan and had special memories from them! A quick snapshot of the flowers from my tablescape. The white hydrangeas already shriveled up so I had to toss them. The last of the perennials for the summer! I saw this barn on a little road trip and had to take a picture. I love red barns and the color of this one attracted me. It's almost burgundy. I'd love to paint our little barn that's behind the garage a color like this and add a couple of windows. Little Teddy is my desk buddy. He knows how to chill! It's raining today and it looks like we'll be seeing more of it throughout the weekend so I think we'll be indoors more than out. Perhaps I can catch up on some things inside. I'm joining Cuisine Kathleen for her "Farewell to Summer" tablescape challenge. I chose to reflect on some of our State's favorite summertime kind of fun! Besides Michigan's claim to fame with the "Motor City" we are a state that also relies on heavy tourism. Not only is Michigan surrounded by the Great Lakes, we are a state loaded with many inland lakes, rivers and streams. I began by hanging a fishnet to my umbrella and made my centerpiece by starting with a 6 ft. garland made of driftwood pieces that I draped around at the base of the umbrella The table top is a "water glass" so we'll pretend that it is our water. I surrounded it with accents to reflect my thoughts. Fishing is a favorite pastime along with canoeing and we have seagulls too (big beggars)! With Labor Day a few days away everyone will be heading up north for their last family hurrah before school starts in Michigan! Lounging around on Adirondack chairs, campfires, boating, water skiing, grilling and camping are wonderful ways to create memories. I added some cut flowers from my gardens and used these cottage styled candle votive holders for a vase. Using my striped plates for a pattern pop I added a layer with a creamy white dish to allow my new salad/dessert plates to be highlighted. I came across these in Mackinaw City recently. They are handmade by a Michigan artist. She put a little heart up where Mackinaw City is located in the state. The napkins are casually gathered using my rope knot napkin rings. Keeping it casual. The last official month of summer is still beautiful. So last Friday I did a post and left a hint of a project I've been working on. While I worked on this I wished I had a friend to share these moments with and bounce ideas off one another. So I chose to write to Ron at The Uptown Acorn and he was the lucky recipient of a bit of my madness! I pieced together some samples of my attempts. Ron kept me on track with certain things like keeping the tall pedestal urns on the inside of the arch inset. The urns were found at a little boutique store. I liked the unusual shape the the hint of green that they were designed with. 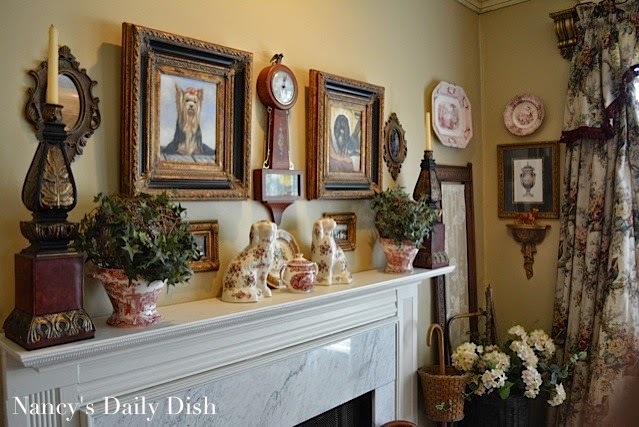 In the middle of my mantel madness I saw a post from Nancy's Daily Dish as seen "here". Our mantels are quite different but the tall candle holders reminded me of my tall pedestal urns and I have two little Staffordshire style dogs so that inspired me. In my case I couldn't put the tall pieces on the ends like she did but moving them inward worked better. I always look for "formulas" for layouts etc., and this one hit me just right. I'm getting a larger glass riser for underneath this lidded urn. I decided It looked better up a tad higher and the glass picks up on the lanterns- adds a little glam. I've had the lidded urn for a while but hadn't considered trying it on the mantel. The little dog statues were from Nell Hills when they still had their on line shopping offered. I don't live anywhere near their stores but I wish I did! Thank you Ron for sharing your thoughts and taking time to do so!